Since he was an infant, Todd Jelinek has been engrossed in a world of tinkering with sound. Todd began studying piano at age 4 and during his high school years was recognized with numerous awards for his solo piano performances. Todd also discovered a passion for percussion, especially in the world of Middle-Eastern hand drumming through which he has an ancestral connection. While studying percussion at Northern Illinois University, Todd received a USOAR grant that allowed him to visit and study with renowned Russian multi-instrumentalist and composer Vladiswar Nadishana in Berlin, Germany. Through the same grant, Todd also traveled to Austria where he studied with virtuosic Persian percussionists Behnam and Reza Samani of Ensemble Zarbang. Todd first encountered steelpan at NIU where he was immediately impressed with the brilliant tone of the instrument and the virtuosity of the pan players he met there. He has been playing pan ever since as a member of the NIU Steelband and has primarily focused on the cello pans. 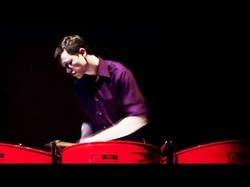 In addition to his percussion compositions, Todd has composed works for steel ensemble, solo cello pans, and a tenor pan solo that was premiered in Trinidad. Having completed his bachelors degree in Percussion Performance, Todd looks to continue performing, composing, and teaching in the west-suburban Chicagoland area.